Akshay Kumar and Parineeti Chopra starrer film ‘Kesari’ is going to knock out in theaters on March 21. The audience was eagerly waiting for the movie for a long time. The fate of Akshay Kumar’s fans is now over and the film is being released on Holi’s special occasion. 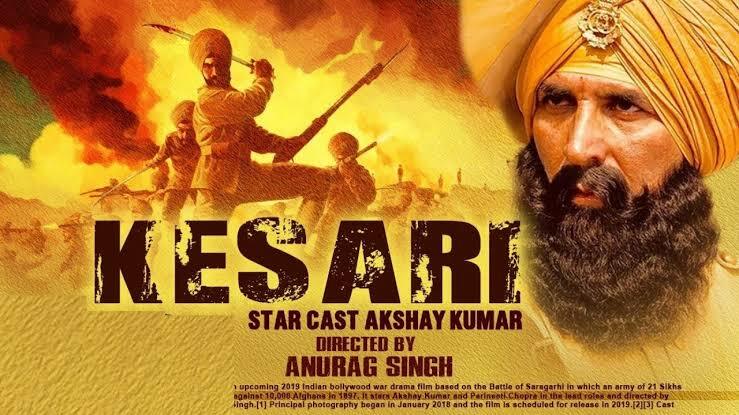 ‘Kesari’ made in the direction of Anurag Singh has been screened in a very spectacular way. In the story of the film, 21 brave Sikhs are the heroes of soldiers. These 21 Sikhs had given dust to 10000 Afghans. At that time, the fear of these warriors was such that after seeing the valor of these soldiers, 10000 Afghani attackers had to pull their feet. Parineeti Chopra is also in Akshay Kumar’s Period movie. In the movie trailer, the actress is seen to be full of laughter and blooming. This film, directed by Anurag, is produced by Karan Johar. The film’s trailer liked the audience quite well. In the trailer, Akshay speaks a dialogue- “An Englishman said that the timid of Hindustan’s clay is born, the time has come to answer today.” Such dialogues are giving a deep impression on the audience, which will create an enthusiasm in the audience. Parineeti Chopra has also given a powerful screen presence in Akshay Kumar’s Period movie. In the movie trailer, the actress is seen to be full of laughter and blooming. This film, directed by Anurag, is produced by Karan Johar. The film’s trailer liked the audience quite well. In the trailer, Akshay speaks a dialogue- “An Englishman said that the timid of Hindustan’s clay is born, the time has come to answer today.” Such dialogues are giving a deep impression on the audience, which will create an enthusiasm in the audience. There is no doubt that the strong fan of Akshay Kumar is following. The advantage of which will be seen at the box office. Tell us, Kesari is based on 21 Sikh soldiers, who saved Saragarhi on 12 September 1891 by bravely fighting 10 thousand Afghans. Akshay Kumar will be seen in the role of real-life hero Ishar Singh in this movie. Actress Parineeti Chopra will be seen in the role of Akshay Kumar’s wife in this period drama movie. Akshay Kumar has once again given the best performance in the film Kesari, directed by Anurag Singh. The scenes of battle in the film are the best shot. Although it is a war film, it has been a long time to establish characters in the audience so that the audience can add themselves to those characters. The story of ‘Kesari’ is the story of the battle of Saragarhi in the year 1897 where only 21 Sikh soldiers had met with a stinging battle against 10,000 Afghans. This battle is considered one of the bravest battles of human history. Even today, it is discussed not only in India but in the whole world. Strong emotions, action and spectacular dialogues are seen in this war drama movie. There is no doubt that this movie, directed by Anurag Singh, is one of the biggest releases of the year. It is Akshay Kumar’s first film in 2019, seeing the film’s craze, it can be said that the film can open from 18 to 20 million. This movie is patriotic and patriotic films are very popular in the country. It is still Akshay Kumar’s viewer will collect himself. Fans were waiting for Akshay’s film, if Holi is discharged and the film is painted in patriotism, then the audience will be able to see this film. Talking about the screen count of Karan Johar’s Dharma Productions, the film is released on 4000 screens in India. This movie is going to be from Takir Bhagyashree’s son Abhimanyu Dasani’s film ‘Mana does not hurt’. But where there is Akshay Kumar in front, there is no difference. No one can stop the film with a banging opening.
. By the way, this movie of Akshay Kumar is made in the budget of 80 crores. The film will have to earn 160 crores to hit which is not a big deal for Akshay’s films. If people like the content of the film, then the film can earn 200 crores. Akshay Kumar and Parineeti Chopra starrer film 'Kesari' is going to knock out in theaters on March 21. The audience was eagerly waiting for the movie for a long time.